Страницы: Пред. 1 ... 15 16 17 18 19 ... 43 След. Опубликовано: 18 июл. 2018 г. Last week we performed short-term operations at an altitude of about 6 km. This allowed closer observations of Ryugu in more detail and the data downlink is happening now. While usual operations are “BOX-A”, these operations at a different maintenance altitude are called “BOX-C” operations. While we did not keep the order, we will do “BOX-B” operations. Do look forward to these! Last week, Hayabusa2 descended to make a closer inspection of asteroid Ryugu. Take a look at what Ryugu's surface looks like at just 6km away! МОСКВА, 26 июл – РИА Новости. Зонд "Хаябуса-2" получил первые сверхчеткие фотографии поверхности астероида Рюгю, сблизившись с ним на расстояние в шесть километров. Снимки и первые результаты наблюдений были представлены на сайте JAXA. Автоматическая станция "Хаябуса-2" была запущена в космос в начале декабря 2014 года для изучения, забора и возврата проб с астероида Рюгю. Как надеются ученые, она вернет на землю первые 100% "чистые" пробы первичной материи Солнечной системы. Японский аппарат достиг цели в начале июня и начал длительную процедуру торможения и сближения с астероидом. Форма астероида неоднократно "менялась" по мере сближения зонда с небесным телом и повышения качества снимков. Сначала ученым казалось, что он был похож на идеальный шар, потом – на "пельмешек" или шарик данго, национальной японской сладости. Более поздние серии снимков и своеобразный видеоролик, полученные "Хаябусой-2" в середине июня, показали, что он имеет более угловатую форму и похож на кубик сахара или кристалл шпата. "Хаябуса-2" официально прибыла к Рюгю в начале июля, остановившись в 20 километрах от поверхности астероида. Последующие несколько недель зонд потратил на включение и диагностику научных инструментов, а также на изучение формы и физических свойств Рюгю. Набрав достаточное количество данных, пилоты миссии продолжили сближение с астероидом, в результате чего "Хаябуса-2" временно перешла на новую, гораздо более тесную орбиту. Через некоторое время зонд включил двигатели и вернулся на прежнюю позицию, безопасную для его работы. В момент максимального сближения зонд и Рюгю разделяло всего шесть километров пустоты, что позволило ученым повысить четкость снимков примерно в 3,4 раза и рассмотреть новые детали его рельефа. К примеру, оказалось, что поверхность астероида покрыта необычно большим числом крупных "булыжников", чье происхождение пока остается загадкой для планетологов. Забор грунта, несмотря на то, что "Хаябуса-2" уже достигла Рюгю, произойдет совсем нескоро. Сначала зонд должен определить свою точную орбиту и скорректировать ее, если возникнет такая необходимость, а затем — всесторонне изучить структуру недр и рельеф астероида. Только после этого межпланетная станция сблизится с поверхностью Рюгю и сбросит на нее своеобразный "взрывпакет", который обнажит и выбросит нетронутый материал из недр астероида. "Хаябуса-2" соберет эту пыль и гальку, левитирующую в вакууме, во время второго пролета над этой точкой. Mattias Malmer‏ @3Dmattias 26 июл. Playing around making shape-model of Ryugu using @haya2e_jaxa data. Exploring the crater on Ryugu. My shape model created from @haya2e_jaxa image data. Credit: University of Aizu, Kobe University, Auburn University, JAXA. Among other things, the images serve as preparation for the landing site selection. The MASCOT lander, which was developed and built at DLR, is due to land on the asteroid in October. As the Japanese Hayabusa2 spacecraft closes in on asteroid Ryugu, more details become visible to the planetary scientists. 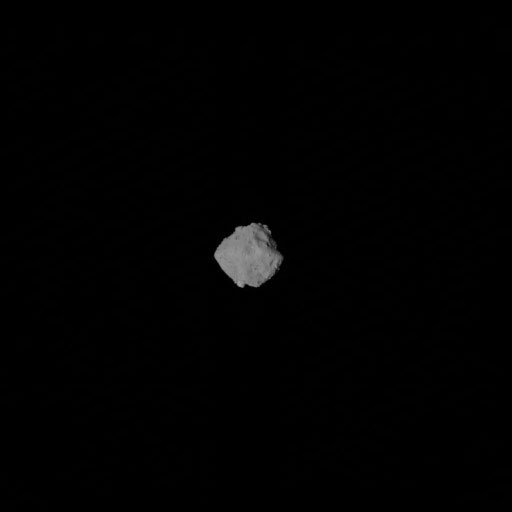 On 20 July 2018, from a distance of just six kilometres, the spacecraft’s Optical Navigation Camera - Telescopic (ONC-T) acquired an image of the asteroid’s surface, with its largest crater. "We see that the entire surface of Ryugu is strewn with large boulders – we have not yet seen this on an asteroid," says Ralf Jaumann, a planetary scientist at the German Aerospace Center (Deutsches Zentrum für Luft- und Raumfahrt; DLR) and Principal Investigator for the MASCOT (Mobile Asteroid Surface Scout) lander aboard the Japanese spacecraft. It is anticipated that on 3 October 2018, MASCOT will land on Ryugu and examine the asteroid surface using four instruments. Since Hayabusa2’s arrival at the asteroid on 27 June 2018, the Japanese Aerospace Exploration Agency (JAXA) had operated it at a height of 20 kilometres (the Home Position) above the surface. 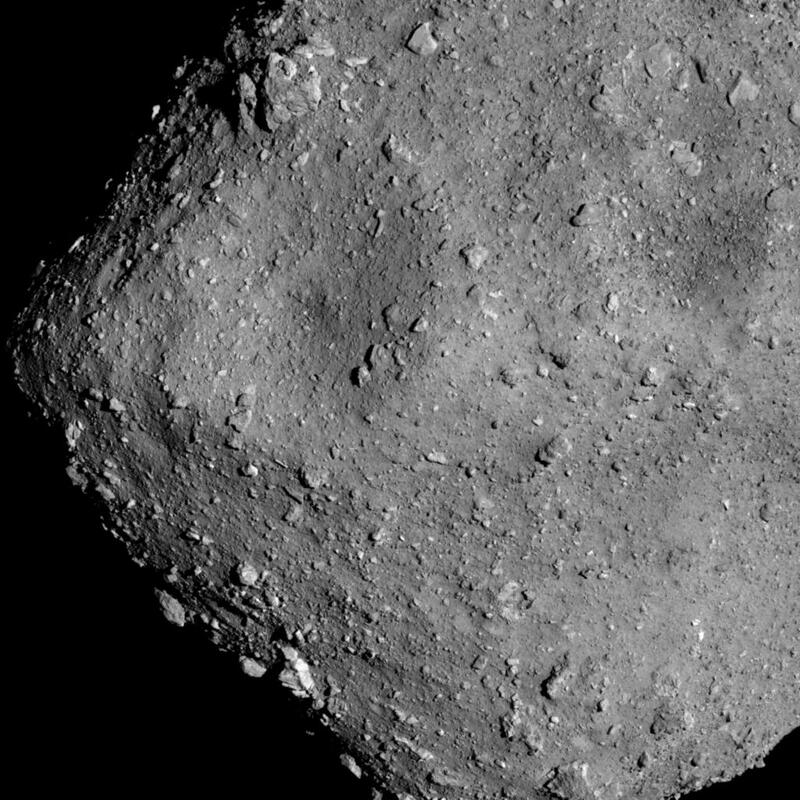 But on 16 July, the JAXA engineers slowly lowered Hayabusa2 from this observation position, until it was six kilometres above Ryugu. The resolution of the images is approximately 3.4 times greater than in the pictures acquired from the Home Position – one pixel now corresponds to about 60 centimetres. A particularly large crater is visible near the centre of the image. For Jaumann, the images coming from some 300 million kilometers away give the opportunity to get a first impression of the asteroid: "It is likely that Ryugu is a fragment of an earlier collision. However, we have only just been at the asteroid for a short while – and all we can see is the surface.” How old is the asteroid? What is its interior like? How dense is it? Is it made up of several agglomerated pieces of debris or is it just one large piece? These are all questions that the planetary scientists want to discuss and answer. 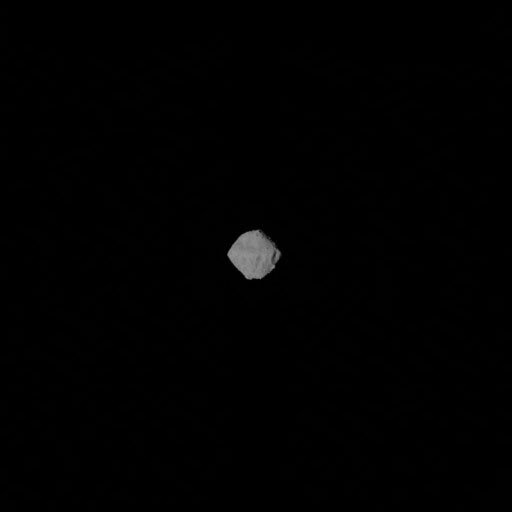 On 25 July 2018, the Hayabusa2 probe returned to its previous position 20 kilometers from Ryugu. In August 2018, the probe will then be lowered again to a distance of approximately one kilometre from the asteroid’s surface to measure its gravitational field, which is estimated to be just 1/60,000th of Earth's. 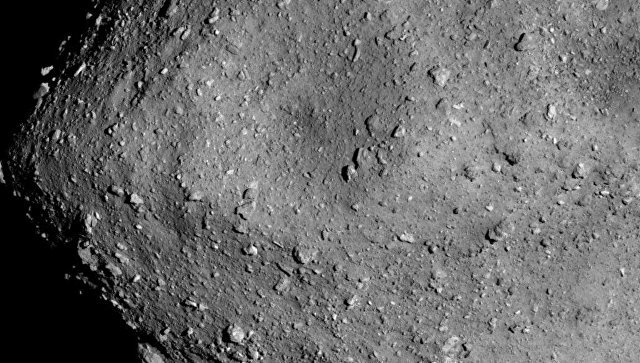 The detailed photographs of the 900-metre-diameter Ryugu and the determination of its gravitational field are also important for the selection of MASCOT’s landing site. At the end of August, the site will be determined by all involved international scientists and engineers. During the mission, Hayabusa2 will also descend to the asteroid’s surface several times and collect soil samples. At the end of 2019, the Japanese probe will begin its return journey to Earth, wh ere it is expected to arrive in 2020 with the asteroid samples. This week, we returned from the 6km altitude “BOX-C” to “BOX-A”, staying at an altitude of 20km±1km while images taken at BOX-C were downloaded. 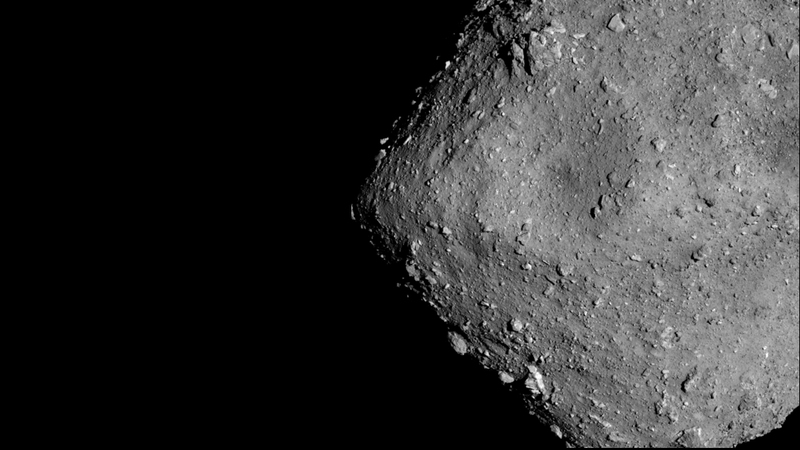 The images released on July 25 showed a detailed view of the unevenness of Ryugu’s surface. Meanwhile, we conducted a test on the laser distance measurer, LIDAR, in preparation for the “Middle Altitude Observation Operation”, in which the spacecraft will descend to hover at a 5km altitude and then perform the “Gravity Measurement Descent Operation” which decreases the altitude to just 1km. We are ready! 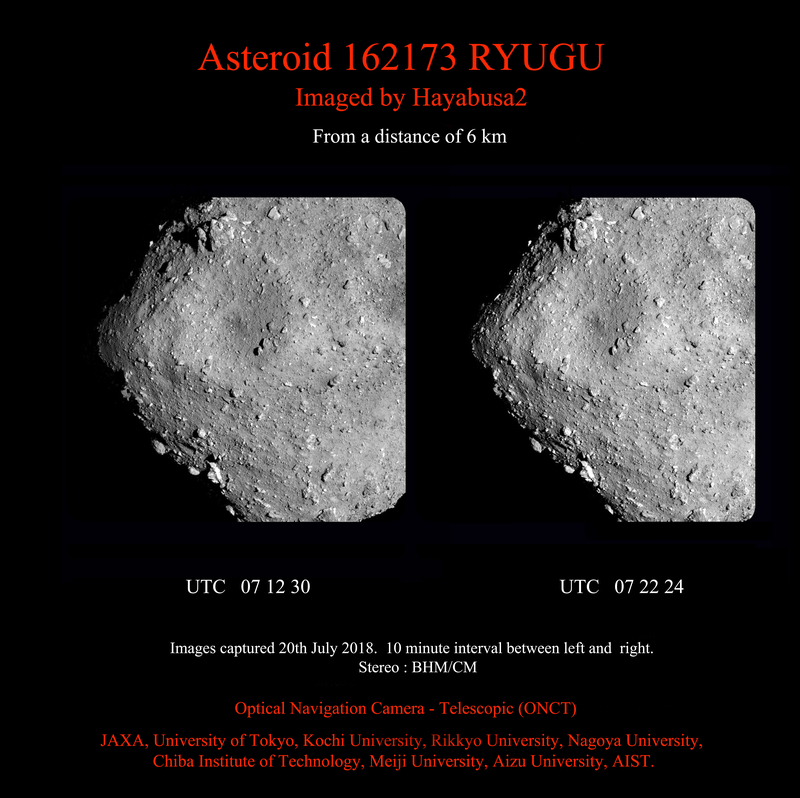 The article posted on July 25, 2018 introduced an image captured when Hayabusa2 descended towards asteroid Ryugu, reaching an altitude of just 6km above the surface. At this time, we also took photographs in which the viewing angle towards the asteroid gradually changed as Ryugu rotated. Using the previously published image and a second image fr om a slightly different angle (see the referlence at the end of this page), we created a composite frame where the two photographs are superimposed in red and blue (Figure 1). 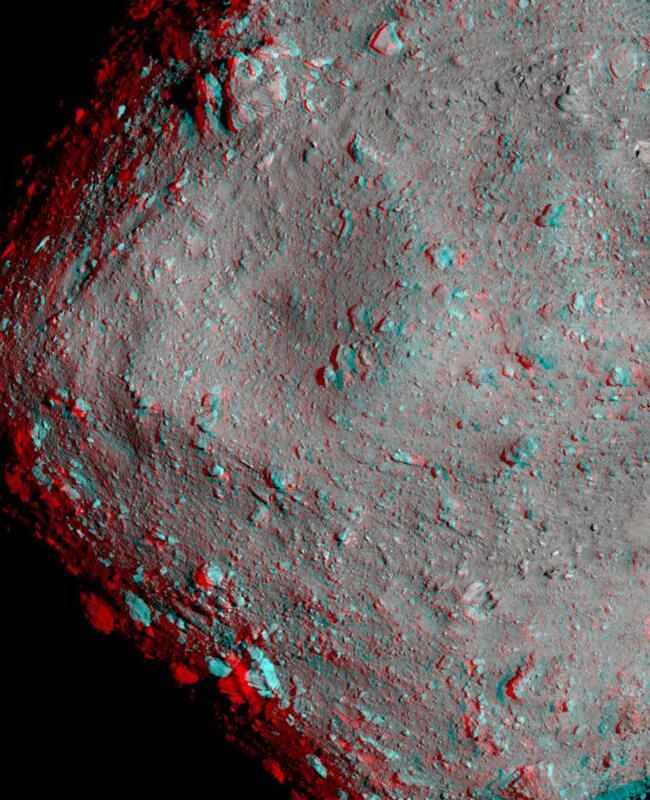 If you view this image with red-blue stereoscopic glasses (right eye should be blue, left eye is red), you can see this high resolution image of the asteroid in three-dimensions and explore the shape and topography of this small world. Figure 1: A red and blue stereoscopic image of Ryugu, prepared from the images taken by the Optical Navigation Camera - Telescopic (ONC-T) at an altitude of 6km. The images were taken on July 20, 2018. Image credit ※：JAXA, University of Aizu, University of Tokyo, Kochi University, Rikkyo University, Nagoya University, Chiba Institute of Technology, Meiji University and AIST. Comparing this new image with the stereoscopic image we previously introduced (part 1, part 2), the three-dimensional view is much more powerful with the irregularities on the surface significantly more emphasized. This is due to the high resolution of the composite photographs which were taken closer to the asteroid, and because the difference in the angle at which each image sees the asteroid is larger than that difference would be between the view from your left and right eye. While it depends on exactly how each person sees the stereo image, do be careful that the features may be exaggerated compared to the actual shape of Ryugu and the contours of the terrain. Different types of topography can be spotted, such as the overhang along the equator of Ryugu in the center of the image and the unevenness created by the variety of large and small boulders as well as the circular dents of craters. 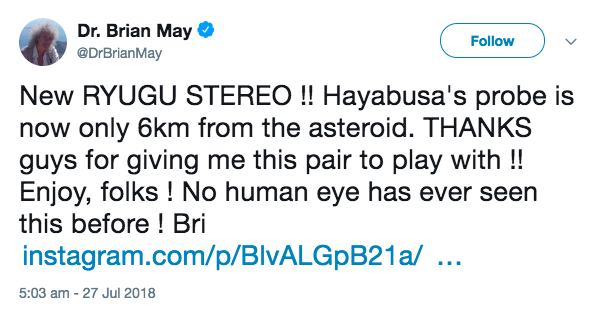 From the images in Figure 1, Dr. Brian May made a second binocular stereo image of Ryugu (the first binocular stereo image is here). Dr. May tweeted regarding the new image (Figure 2), which we show in Figure 3. Figure 3: Binocular stereo image by Brian May, from Instagram. The Hayabusa2 Project team once again thanks Dr. Brian May for the creation of this binocular stereo image! We hope everyone will enjoy both the red/blue and binocular stereo images and explore Ryugu's landscape with us. Below is the source of the second image in the stereo pair. The first image can be found in the article from July 25. Figure 4: Asteroid Ryugu from an altitude of 6km. Image was captured with the Optical Navigation Camera - Telescopic (ONC-T) on July 20, 2018 at around 16:00 JST, after 10 min from the another image. ※ Please use the displayed credit when reproducing these images. In the case wh ere an abbreviated form is necessary, please write "JAXA, University of Aizu & collaborators". [MAltOp] 9:35am was “Gate1”: the time when we judge if we can begin with the descent operation. After checking the status of both the spacecraft and ground-based systems, no hindrance was found to starting the descent. The Medium Altitude Operation is “Go”! [MAltOp] At 10:38 JST we confirmed that Hayabusa2 had started the descent. The starting altitude was about 20 km and the descent speed was 40 cm/s. [MAltOp] Hayabusa2’s wide-angle optical navigation camera (ONC-W1) snapped this photograph of Ryugu for navigation at 08:00 JST on August 1, 2018. [MAltOp] At around 10:00 JST on August 1, 2018, Hayabusa2 took this image for navigation using the onboard wide-angle navigation camera (ONC-W1). [MAltOp] At 18:00 JST (09:00 UTC) the ground operation station used to communicate with the spacecraft was handed over from JAXA’s Usuda Deep Space Center to DSN Madrid. [MAltOp] At about 12:00 JST on August 1, 2018, this image of Ryugu was snapped for navigation by the wide-angle camera, ONC-W1. [MAltOp] At 20:32 JST we reached "Gate 2 (target altitude reached)": the checkpoint near the 5km target altitude for observations. We have confirmed the descent of Hayabusa2 has stopped. The navigation guidance state and the state of the spacecraft is normal. , на которых есть платина, редкие изотопы и т.д. на околоземную орбиту, к международной космической станции или на землю.